In 2010, I encouraged investing in a Le Creuset saucier. Some years later, I stand by that endorsement. Here is that same vessel practically making my Thanksgiving cranberry sauce for me. This thing has never let me down. If you haven't gotten one yet, you may want to start dropping hints to Santa. In the something new department, I have a two-fer for you. The first is a fluted bundt pan. I recommend the Nordic Ware Heritage Bundt, depending on where you buy it (or which catalog you dog-ear and leave on the coffee table as a powerful suggestion), it will cost somewhere from $30-$40. Its heavy construction cooks like a dream and the non-stick surface will release your sweet creation with perfect definition certain to impress. For some reason most people don't realize these shapes are actually made by the shape of pan you use and I find the oohs and ahs that come from using this one yield a pretty good kitchen tool ROI. Now you need something to carry your cake in. 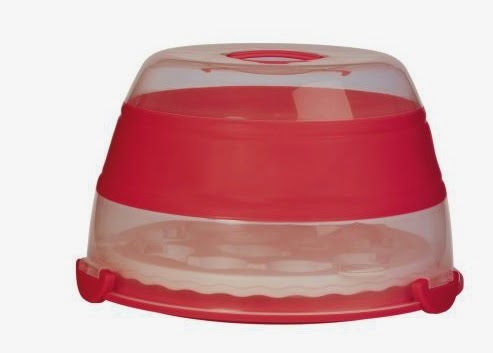 I recommend this collapsible cupcake and cake carrier. After you took care, or your pan did anyway, to make sure each peak came out perfectly, do not risk ruining your cake in transit by wrapping it in saran wrap and shoving it in a bag. This carrier has the flexibility to transport small cakes, large cakes and cupcakes and has a handle for easy carrying. And for those living in New York shoe box apartments, the collapsible feature is a nice bonus, or in some cases a must. This carrier will run you around $30 but there is something that lets party guests know you mean business when you show up brandishing this case like the hope diamond is inside.